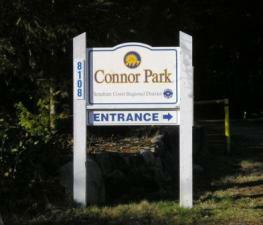 How to get to Connor Park: From Sechelt drive about 7 or 8 kms or 10 minutes northeast and turn left on Redrooffs Rd. Follow along Redrooffs for about 3 or 4 kms until you come to Southwood on your right (3rd road you come to on the right). Take the first left up Westwood Rd. and at the stop sign at Northwood Rd. go straight into the park on the gravel access road. 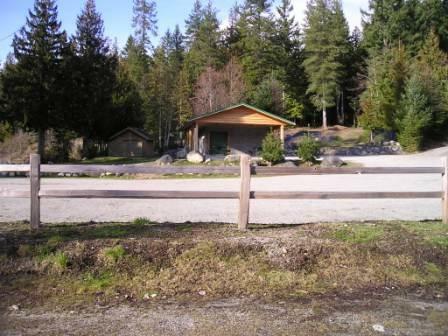 Connor Park is a Sunshine Coast Regional District park. It's a beautiful forested area with lots of short trails most of which are easy or intermediate difficulty for those of you riding. Near the entrance to the park and parking lot there are playing fields, washrooms, a playground and a fun bike skills area. 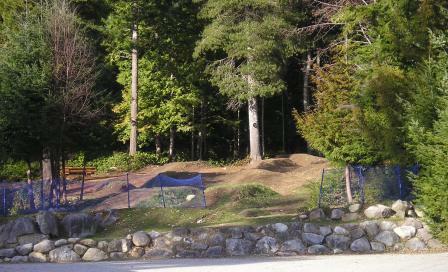 Many of the trails in Connor Park and Halfmoon Bay were built and are maintained by the local Sprockids group. Take a look at the map to see the different trails and how to connect to the more extensive network of trails that wind around the Halfmoon Bay area. Below I've listed all of the trails that fall within Connor Park. Over time I plan to provide you with all of the information you will need to find and enjoy each and every one of them. Please keep in mind that most of these trails would be ridden or walked in combination with others and don't generally stand alone. Check out the map to see how they weave together. Please keep in mind what is easy or hard in my opinion, you may find the opposite. For your reference, I have been riding for about 15 years, but consider myself a beginner/intermediate rider. To see the trails outside of the park, check out the Halfmoon Bay link. This trail is one of the main access trails into the Connor Park trail system and beyond to the Halfmoon Bay trails. It enters off of the Connor Park access road and basically marks the eastern boundary of the park at the Halfmoon Bay Elementary School playing fields. Like all of the trails in the park, it is short and sweet with downhill when you head out and uphill if you come back on it. It's a pretty easy riding trail with just a few rooty areas to navigate. Sprockids Run trail joins this trail and at its end if you go slightly right it turns into Squiggly which leads you down to Datsun Alley (one of the main Halfmoon Bay trails) and a hard left will take you up Midway. Slightly more challenging where it enters off School Daze, this trail connects you to Connor Connector and Pick It Up, where it ends. It's a bit twisty and rooty in the first section, but the second section between Connor Connector and Pick It Up is a breeze. Another slightly challenging trail, Midway begins and ends off School Daze and Pick It Up. The section between School Daze and where Connor Connector joins it is a good climb and a bit slippery for the last several feet due to loose rock. Once up to this point, it is a very easy ride out to Pick It Up. Can-Can is one of the newest trails in Connor Park. Built within the last year or two, it is a very short piece of trail that connects Pick It Up and Sprockids Run. Most of this trail is a hill and has a ramp with drop at the Sprockids Run entrance. This trail is another main entrance into the park and starts at the top right corner above the playing fields. If you bring a vehicle and park in the lot, there is a trail that runs along and up between the playing fields and the bike skills area. This little trail itself is difficult with a steep climb and large roots to climb over. Once you actually enter into Connor Connector the very first part has some roots, but then smooths out and is super easy to ride. Sprockids Run and Midway intersect this trail. It does not get you down to Datsun Alley unless you cut over to Pick It Up or Squiggly. You can enter into Pick It Up at the far end of the playing fields. A bit of a climb for the first few hundred metres, it then levels off and once you get to In & Out trail it heads down hill to Datsun Alley. This trail is very easy (except for that first darn hill) and a good way to enter the park and on to Halfmoon Bay trails via Datsun Alley for beginner riders. Out & In, Sprockids Run, Midway and In & Out can be accessed off Pick It Up. GPS Waypoints - 49° 29.325N, 123° 53.350W (where trail joins Datsun Alley), where Pick It Up enters at Connor Park 49° 28.973N, 123° 53.446W. Out & In is generally considered an intermediate level mountain biking trail. However, I find it an easy ride over to the Water Tower road. You can enter it off of Pick It Up or the Water Tower road. Although officially this trail falls outside of the Connor Park boundary I couldn't put it off with the Halfmoon Bay trails, especially considering that its partner Out & In does fall within the boundary of the park and these two trails are most often ridden together. This trail is a little more challenging to ride than Out and In because it has a few more rooty areas and logs to get over. It can also be entered off of Pick It Up or the Water Tower road. Pterodactyl (see Halfmoon Bay trails) can be reached off of this trail. There are three or four trails below the playing fields in the park. These unnamed trails are fun for young beginners to practice on. If you have any questions about Connor Park or you just want to share something about these trails, please contact me.